The participants in this match were listed incorrectly on every site I checked, as it is ASUKA in the match (WAVE Joshi wrestler), not Menso-re Oyaji. Which is a pleasant surprise. This is a unique combination of wrestlers to say the least, Kobayashi wrestles in Big Japan while Hayate wrestles in his own promotion called Itabashi Pro. Yanbaru Quee-na is Kyoko Kimura under a mask, I’ll just type her real name from here on out to make my life easier. On the other side, Golden Pine is Big Japan wrestler Masato Inaba under a mask, while ASUKA is a young wrestler from Pro Wrestling WAVE. Super Delfin is a living legend, long time promoter and star of the now defunct Osaka Pro Wrestling, and current wrestles in various smaller indies. ASUKA and Kimura start the match, ASUKA goes off the ropes and knocks down Kimura with a hard shoulderblock. They both go off the ropes and she does it again before tagging in Golden Pine. Kobayashi also is tagged in, they do some slow motion holds and do a bit of comedy before Abdullah knocks Golden Pine out of the ring. Hayate and Super Delfin come in, lariat by Super Delfin and he hits the tilt-a-whirl backbreaker. Kimura comes in the ring but Super Delfin hits a snap vertical suplex before covering her for two. Delfin tags in Golden Pine, he does some bad comedy before tagging in ASUKA. ASUKA throws down Kimura by her hair a few times, she tags in Golden Pine and together they shoulderblock Kimura to the mat. Golden Pine and Kimura trade chops, roll-up by Kimura and she gets a two. Kimura tags in Abdullah but he hurts his knees when he jumps into the ring. ASUKA comes in but Abdullah thrusts them both in the throat before hitting a double shoulderblock. Shining Wizard by Abdullah to Golden Pine, but the cover is broken up. Everyone comes in and they run into each other, knocking everyone to the mat. ASUKA and Hayate go at it, ASUKA gets on the top turnbuckle and she hits a diving crossbody. Dropkick by ASUKA but Hayate ties her up into a modified dragon sleeper. Golden Pine breaks it up, Kimura and Abdullah come in and Golden Pine is double teamed in the corner. Body press by Abdullah, Kimura picks up Golden Pine but Hate hits Kimura by accident. Golden Pine kisses Hayate then hits a modified uranage on Kimura, Abdullah comes in but ASUKA hits him with a missile dropkick. Tornado DDT by Super Delfin to Kimura, he puts her in the Delfin Clutch and picks up the three count! Golden Pine, ASUKA, and Super Delfin win! Really just a silly six wrestler tag with some iffy comedy and chaos. ASUKA actually looked the best even though she is the youngest, as the bulk of the match was controlled by slower wrestlers (looking at you, Golden Pine). Kimura under a mask was fine but didn’t do anything special. A pretty skippable opening match. This is a Gauntlet Match. The Gauntlet Match is a series of singles matches pitting members of each team against each other. Each match will go on for two minutes, and a team will get a point for each pinfall or submission they get within that two minutes. If the match ends with a draw after all eight have wrestled, then there will be a Sudden Death round that will have no time limit in a regular tag team match. Cherry vs. Kaori Yoneyama: The DDT and YMZ wrestlers are the first two in, quick crossbody by Cherry but Yoneyama bridges out of it and hits a dropkick. Jumping lariat by Cherry, she picks up Yoneyama but Yoneyama elbows her and they trade shots. Throat thrust by Yoneyama and she knees Cherry in the back of the head before hitting a running senton. Cherry elbows out of the suplex and kicks Yoneyama in the face, sliding kick by Cherry and she hits a bridging exploder for a two count. The bell rings and the match is a draw! No points are awarded. Hanako Nakamori vs. Yuko Miyamoto: JWP vs. Big Japan is next as they trade wristlocks, kicks to the chest by Nakamori but Miyamoto catches one and elbows her in the knee. Big boot by Nakamori and she throws down Miyamoto by the hair, but Miyamoto grabs her and returns the favor. Miyamoto pulls on her hair but he is tripped from the floor by Kuragaki, La Rojo by Nakamori and she gets the three count! Her team gets one point. Miyamoto goes for a few quick pins but the time expires before he can’t get his own cover as the bell rings. Team Command Bolshoi is up 1-0. Command Bolshoi vs. Yuki Miyazaki: JWP vs. Freelancer as Bolshoi quickly applies a hanging headscissors, but Miyazaki gets into the ropes. Tarantula by Bolshoi on the second rope, she lets the hold go but is hit from ringside. Sliding Kick by Miyazaki and she snaps off a quick DDT. Leg drop by Miyazaki while Bolshoi is hung over the second rope and she hits a dropkick from the floor. Back in the ring, Miyazaki picks up Bolshoi but Bolshoi rolls away and they trade quick pin attempts. The bell rings, signifying that time has expired, no points are awarded. Gabaiji Chan vs. Tsubasa Kuragaki: PSYCHO in old man character slowly gets in the ring to face the veteran Kuragaki, he slowly walks around the ring and appears to be confused on where he is. He remembers as Kuragaki tosses him to the mat, Gabaiji-chan reverses the Irish whip however and goes for a lariat, but Kuragaki ducks it and hits a lariat of her own. Kuragaki goes up top but Gabaiji-chan holds his cane up so she jumps back down. Kuragaki goes for a lariat but Gabaiji-chan pins her down using the cane, picking up a three count! Gabaiji-chan gets a point. Gabaiji-chan chokes Kuragaki with the cane for the rest of the match, with the score now 1-1. Miyamoto and Kuragaki go at it as the match continues now as a regular tag match, hard shoulderblock by Kuragaki and she puts Miyamoto in a stretch hold. Yoneyama runs in to help as they make a chain to put more pressure on Miyamoto, Yoneyama then comes in the ring but Miyazaki does too. Miyazaki and Miyamoto both dropkick Yoneyama, but Yoneyama hits a double armdrag. Double lariat by Kuragaki and she tags in Yoneyama. Swinging side slam by Miyamoto but Yoneyama quickly gets up and knees him in the back of the head. Handspring Elbow by Miyamoto, and he makes the hot tag to Miyazaki. Dropkick by Miyazaki, she picks up Yoneyama but Yoneyama gets away from her. Yoneyama tags in Nakamori, Miyazaki grabs her and puts her in a submission hold before releasing it to tag in Cherry. Nakamori lariats both of them before hitting a fisherman suplex on Cherry, but it gets a two count. Sleeper by Cherry and she rolls Nakamori to the rope with an armbar, but it is quickly broken up. High kick by Nakamori but Cherry hits a double chop to the face, she tags in Bolshoi while Gabaiji-chan is also tagged in. Bolshoi tries to Irish whip Gabaiji-chan but he is too slow so she schoolboys him instead for a two count. Everyone runs in to attack Gabaiji-chan, Bolshoi covers her but Gabaiji-chan gets his cane in the ropes to force a break. Gabaiji-chan comes to life since he dropped his cane and attacks all four of his opponents, his teammates come in and Gabaiji-chan hits a Swanton Bomb on Bolshoi for a two count. Gabaiji-chan grabs Bolshoi but Bolshoi hits a Jikkiden Kabuki Upperblow for the three count! Team Command Bolshoi wins! I have no idea why they had the weird Gauntlet to start if they were going to make it into a regular tag match anyway. 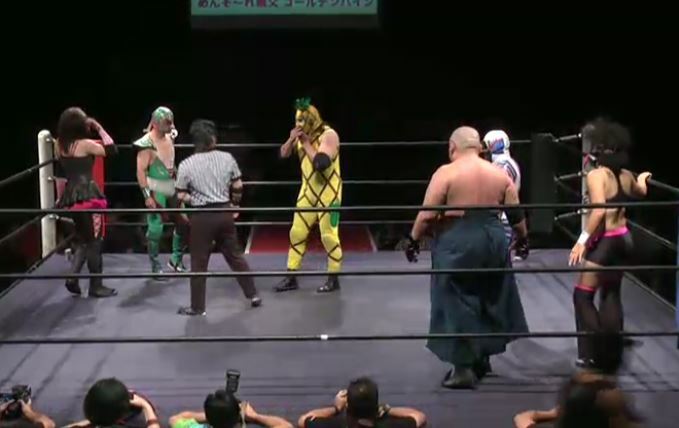 The match had its amusing parts for sure but was a bit too much of a cluster and really none of the wrestlers stuck out aside from Gabaiji-chan. Which isn’t surprising since wrestling like a grandpa is an unusual gimmick. Decent midcard fodder but nothing more. Now the action has really picked up. I am not sure how this match was even constructed, Kyoko really pulled some strings. Iwatani wrestles in Stardom and they rarely wrestle outside of the promotion, and it being an intergender match for her makes it even more unusual. 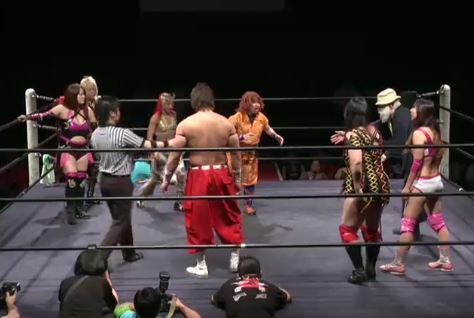 Mochizuki wrestles in Dragon Gate, while Kenou is in NOAH and Syuri is a Freelancer that is also a MMA fighter. This is one of those ‘once in a lifetime’ type of matches as I highly doubt these four will ever be in the same ring again, this will be fun. Syuri and Iwatani start the match and trade wristlocks, Irish whip by Iwatani but Syuri hits an armdrag before they both return to their feet. They tag in Mochizuki and Kenou who exchange leg kicks but they avoid each other’s leg sweeps. Eye rake by Kenou and he tags in Syuri, Syuri kicks Mochizuki hard in the back and taunts him as he returns to his feet. Mochizuki kicks Syuri in the leg and returns the favor with a kick to the back, but Syuri stands up and kicks Mochizuki again. Mochizuki tags in Iwatani after throwing Syuri into the corner, kick to the back by Iwatani and she covers Syuri. Syuri quickly kicks out and kicks Iwatani before tagging in Kenou. Kenou kicks Iwatani and steps on her, he tags Syuri back in and she kicks Iwatani in the corner. Chinlock by Syuri but Iwatani quickly gets into the ropes, elbow by Iwatani and she tags in Mochizuki. Syuri tags Kenou as well, Kenou and Mochizuki trade kicks to the chest until Mochizuki catches one and hits a dragon screw. Mochizuki tags in Iwatani, kicks by Iwatani but Kenou kicks her hard in the chest. Kenou tags Syuri, Syuri chokes Iwatani against the ropes before kicking her some more. Iwatani grabs the ropes to try to stop the kicks from Syuri, but Syuri just puts her in the ropes and chokes her. Syuri tags Kenou, scoop slam by Kenou and he hits a running footstomp for two. Syuri returns and knees Iwatani, but Iwatani hits an enzuigiri. Kenou is tagged in but Iwatani rolls to her corner and tags in Mochizuki, who quickly cleans house. Boots by Mochizuki to Kenou but Kenou kicks him back, they trade kicks until Mochizuki sends Kenou to the mat. Iwatani comes in and they double team Kenou, hurricanrana by Iwatani to Kenou but Kenou blocks Mochizuki’s suplex attempt. Syuri kicks Mochizuki from the apron, giving Kenou time to recover and tag her in. Kicks by Syuri but Mochizuki hits a leg sweep, he goes off the ropes but Syuri dropkicks him in the leg. Jumping knee by Syuri in the corner and Kenou hits a running double knee, tornado DDT by Syuri and Kenou hits a diving footstomp. Buzzsaw Kick by Syuri, but Iwatani breaks up the pin and then hits a headscissors on Kenou. Mochizuki tags her in, elbows by Iwatani to Syuri and she floors Syuri with a jumping elbow. Back up, Syuri knees Iwatani into the corner and she hits a jumping knee followed by a double underhook suplex for two. Back up they trade elbows, Syuri knocks down Iwatani with a jumping knee and stomps on her as she returns to her feet. Kenou kicks Syuri from the apron, Iwatani hits a dragon suplex hold on Syuri but Kenou breaks it up. Mochizuki runs in and puts Kenou in an ankle hold, but Kenou reverses it. Syuri puts Iwatani in a cross armbreaker and then a seated armbar, but Mochizuki breaks it up. Iwatani hits another dragon suplex, but Syuri gets a shoulder up. Syuri quickly rolls up Iwatani for two but Iwatani returns the favor with her own quick cover. Syuri and Iwatani trade elbows as they return to their feet, running knee to the face by Syuri but Mochizuki breaks it up. German suplex hold by Syuri to Iwatani, but again the cover is broken up. 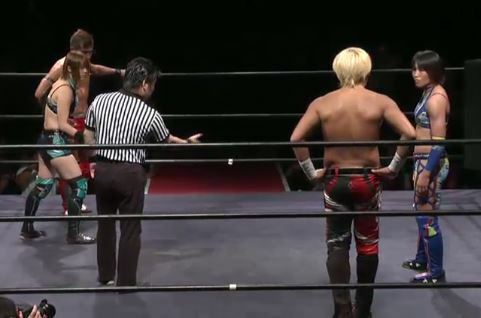 Iwatani goes up to the second turnbuckle and hits a diving footstomp, but Kenou breaks up the pin. Iwatani picks up Syuri and hits a Northern Suplex Hold, but Syuri kicks out just as the bell rings. Time is expire and the match is a Draw. While I am no puroresu historian, I can say with some certainty that matches pitting parents vs. children are very unusual. Besides the fact that second generation wrestlers aren’t quite as common in Japan, usually there is enough of an age gap that by the time the child has reached a high enough level in wrestling, the parent has already retired. And of course not all parents want to wrestle their children anyway. Kyoko has no qualms with that, which leads us to this match. Hana debuted just last spring after graduating from the W-1 Dojo, and only has had a handful of matches. There is no question that Kyoko is winning this match, but maybe she can teach her child a few things that will benefit her for the rest of her career. Hana goes for a takedown early and gets Kyoko to the mat, but Kyoko quickly changes positions with her. They jockey for position on the mat until Kyoko gets up and starts kicking Hana in the leg. Kyoko keeps working on the leg before applying a crossface, but Hana gets into the ropes. Kyoko spanks Hana before jumping down on her back, one foot cover by Kyoko but Hana gets a shoulder up. Elbows by Hana but Kyoko elbows her hard to the mat, dropkick by Hana and she hits a double knee in the corner. Another one by Hana, she gets on the top turnbuckle and she hits a missile dropkick. Hana picks up Kyoko and hits a vertical suplex, but Kyoko kicks out at two. Short armbar by Kyoko and she then applies a Kimura, armbreaker by Kyoko and she snaps her arm over the top rope. Back in the ring, Kyoko rolls Hana to the mat and applies an armlock, but Hana gets a toe on the ropes. Hana trips Kyoko and hits a big boot against the ropes, but Kyoko boots her back in return. Another big boot by Kyoko and she kicks Hana in the face a few times, hard elbow by Kyoko and she hits a vertical suplex for two. Kyoko goes for a running knee but Hana avoids it and rolls her up for two. Kyoko goes off the ropes but Hana hits a big boot for a two count. Hana goes off the ropes but Kyoko jumps up and rolls her to the mat. Kyoko applies a cross armbreaker, and Hana quickly taps out! Kyoko Kimura is the winner. As I mentioned somewhere in the review, this is one of those bizarre wrestler produced shows that happens a few times a year in Japan, with match-ups that even a crazy person couldn’t think up. What hurt the card was simply that it was only four matches, and two of those matches weren’t real matches so really it was a two match show. Luckily, both of those matches delivered, with the tag match being a high-end strike based battle and the main event being a special attraction as the retiring Kyoko Kimura taught her daughter a thing or two in the ring. I’d recommend it just for those two matches, just don’t expect a lot from the undercard on this show.